Adventures in Social Research: Data Analysis Using IBM® SPSS® Statistics from Earl Babbie, William E. Wagner, III, and Jeanne Zaino offers a practical, hands-on introduction to the logic of social science research for students in many disciplines. The fully revised Tenth Edition offers step-by-step instruction on data analysis using the latest version (24.0) of SPSS and current data from the General Social Survey. Organized to parallel most introductory research methods texts, this text starts with an introduction to computerized data analysis and the social research process, then takes readers step-by-step through univariate, bivariate, and multivariate analysis using SPSS Statistics. 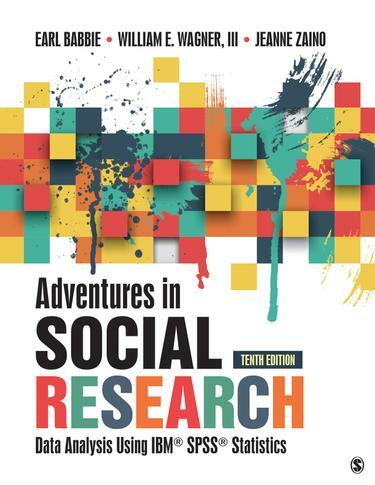 The range of topics, from beginning to advanced, make Adventures in Social Research appropriate for both undergraduate and graduate courses.